Journalists Ben Packham and Greg Brown writing in The Australian report even more worrying connections between Victorian Premier Daniel Andrews and his secret deal with the Chinese Communist government. Andrews’ secrecy includes his ‘special consultant’ who is a probable operative under the marching orders of the Chinese Communist Party’s United Front Work Department. This level of involvement by any Australian so actively working to facilitate China’s global trade dominance requires the invention of a new word because the old one of “traitor” has lost all significance! A staffer in Daniel Andrews’s office has been linked to China’s United Front organisation, which co-ordinates Beijing’s overseas influence operations, amid growing criticism of the Victoria Premier’s decision to sign up to Beijing’s Belt and Road Initiative. The Australian can reveal Mr Andrews’s adviser Marty Mei was named a “special consultant” to the Shenzhen Association of Australia, which is part of a network of organisations in Australia that is guided by the Chinese Communist Party’s United Front Work Department. Chinese property developer Huang Xiangmo — branded by Malcolm Turnbull as “a foreign national with the closest links to a foreign government” — was appointed as one of the association’s eight honorary presidents. Mr Mei, a former multicultural adviser and now media adviser to the Premier, has travelled several times with Mr Andrews to China and claimed at last year’s World Chinese Economic Summit in Malaysia to have “played a key role in the development of Victoria’s New China Strategy”. Melbourne Ports member Michael Danby yesterday became the first Labor MP to speak out publicly against Mr Andrews’s decision to sign a secret memorandum of understanding with China to join the BRI, saying all Australian governments should steer clear of the initiative. “It is a strategic package and I therefore think that we need to think of it in terms of how they are trying to leverage poor countries in the South Pacific. We shouldn’t give any credence to that,” Mr Danby told Sky News. Mr Danby spoke out after three federal Labor MPs told The Australian they were astonished the Andrews government had decided to break ranks with federal Labor to back the initiative. The Australian has also spoken to state MPs who are furious with Mr Andrews’s decision, questioning whether it was a “captain’s call”. “He has stepped over the mark this time,” a senior Andrews government MP said. Mr Andrews’s spokeswoman refused to say whether the decision was endorsed by cabinet. Mr Mei was named by two Chinese language news sites as a “special consultant” to the Shenzhen Association of Australia and the related Shenzhen Business Association of Australia. He received a glass statuette in appreciation of his role at the ­association’s 2016 inauguration. The Overseas Chinese Federation is an agency of the United Front Work Department. The Australian contacted Mr Mei but he declined to comment. The Australian is not suggesting Mr Mei has engaged in any wrongdoing. Mr Andrews’s spokeswoman said Mr Mei “attended the launch of the Shenzhen Association in Melbourne in his professional cap­acity, just as he attends numerous community multicultural functions”. She said a staffer to Opposition Leader Matthew Guy also attended the event. China watcher Clive Hamilton, whose book Silent Invasion details Beijing’s sophisticated campaign to extend its influence in Australia, said there was no doubt over the Shenzhen Association of Australia’s links to the United Front and the Chinese Communist Party. “It is extremely revealing that a senior Communist Party official arrived in Melbourne to oversee the inauguration of this United Front group,” Professor Hamilton said. He said Canberra had been pushing back against Chinese influence, prompting the Chinese Communist Party to focus more on the states. “With the signing of the Belt and Road MOU, Victoria has succumbed to Beijing’s divide and rule tactics,” he said. Mr Guy hit out at the Premier for refusing to release the terms of the BRI agreement. “Victorians have a right to know what the Premier has signed us up to,” Mr Guy said. Next thing is he’ll dress in blue tights, wear his red underpants outside, put a “P” on his chest and run around in ever decreasing circles calling “Pooperman”. He’s certainly crapped on Victoria. is there no rule of law that the Federal Government should be able to sack this man Andrews for treason . Have we no checks that the Australian Government in the interests of Victorians can do nothing, They sit there while this State is in the firing line and do nothing to protect it. The troubling part is that Daniel Andrews is likely to win the coming state election, what then? More African gang crime, more windmills and more blackouts? 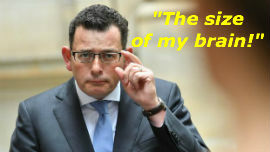 I trust those Victorians who vote for Andrews, enjoy the fruits of their labour. There is little difference between Daniel Andrews and Treasonous Turnbull. Both would sell Australia out for personal satisfaction and both should be made pay for their crimes. As Sybil said about the Irish builder. I have seen more intelligent things on the bottom of ponds.